Migration to Delhi from neighbouring states is changing the social dimensions of the city. Economically and socially marginalized communities often live in unauthorized or illegal colonies and slums, where provision of basic services, especially water, is irregular, inadequate, and of unacceptable quality. Communities living in legally sanctioned colonies tend to be wealthier, to be more powerful socially, and to enjoy better services. In this asymmetric scenario, underprivileged and marginalized people struggle daily to obtain water for their needs, sometimes succumbing to corruption and other illegal means to survive. This WIN brief explores the plight of these people, reflecting on the situation in many urban cities today. According to the UN, about half of the world’s population will live in cities by the year 2030. Inequality and corruption are likely to blight the water sector in these cities as it does in Delhi. Understanding the risks better and exploring the dynamics of integrity in urban water today are essential steps to achieving for equitable and effective service for all. Delhi, officially known as the National Capital Territory (NCT), is the capital of India. It is the world’s second largest megacity, after Tokyo, with an agglomeration of 25 million inhabitants and growth predicted to reach 36 million by 2030 (United Nations, 2014). Delhi is also among the top 40 cities in terms of wealth-making worldwide, with a per capita income of more than 3,000 US$ in the year 2012-13 (Delhi Human Development Report, 2013). Also called the city of migrants, Delhi welcomes an estimated 78,000 migrants annually, people searching for education and employment opportunities and for a better quality of life (Delhi Human Development Report, 2013). Nevertheless, some 10 per cent of Delhi’s population live below the poverty line, according to the standard prescribed by the former Planning Commission (Economic Survey of Delhi, 2014–15). Delhi houses the rich, the middle class, and the poor. There are eight types of housing settlements for the residents, of which only one is termed ‘planned’ and the other seven are ‘unplanned’ colonies. 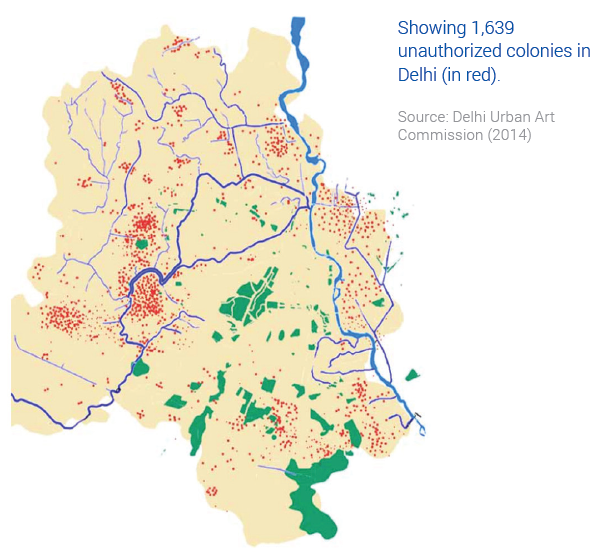 As the population of Delhi has grown, the number of ‘unauthorized’ colonies has also increased from 110 in 1962 to 1,639 in June 2014—largely occupied by lower-middle class and poor residents of the city. Planned and unplanned settlements as well as socio-economic status play key roles in Delhi’s housing. Some of the settlements, mostly planned, house the higher income groups; the lower income groups—consisting of poor, low-income migrants, especially those from rural belt and minority groups—tend to reside more in the unplanned or unauthorized colonies. This in turn has an impact on access to water, where the planned high-income colonies receive more water than the poorer low-income colonies. For example, some areas in Delhi have 24 hours of sufficient water supply while others struggle to fill their buckets every day (Mahendra Dev and Yedla, 2015: 162). Localities like Mehrauli and Narela received only 29 litres per capita per day (lpcd) of water whereas upmarket Cantonment Board received over 500 lpcd of water (the highest amount in the city) and Karol Bagh received 337 lpcd (Narain, et. al, 2012). This imbalance is typical of water distribution in Delhi. Although water is a basic human right (United Nations, 2010), about half of the population of Delhi is living in unauthorized colonies where most of the population lives in abject poverty, with unacceptable standards of water supply and quality (Agrawal, 2013). These colonies are not officially connected to the network of water pipelines. Residents wake up early and spend hours fetching water every day. Given the intermittent water supply and the difficulty of meeting demand via the piped network, water tankers cross the city to fill the gap. These tankers get their water either from the water utility, Delhi Jal Board, or from private borewells. In the unauthorized South Delhi colony of Sangam Vihar, for example, almost all of its 400,000 residents (World Health Organization, 2011) depend on private water suppliers. Low-income areas in other colonies in the south of the city—including both authorized and unauthorized ones, such as Okhla, East of Kailash, and Greater Kailash—also depend on private water suppliers when their pipes go dry (Bansal, 2012). The National Commission on Urbanization confirms that the water supply system in India is highly biased in favour of the rich, the powerful, and the influential, with the poor suffering an artificial water scarcity (Panickar, 2007). This is particularly true in Delhi’s case. Delhi’s urban water management is influenced by cultural values, societal patterns, and politics. Caste, religion, and political dynamics influence water management significantly and deepen critical integrity issues of inequality and discrimination. These political and social boundaries are associated with a high rate of migration of diverse ethnic groups. This migration affects the city’s social and political structure, which is fragmented into groups reflecting different ethnicities, nationalities, castes, sub-castes, religions, and languages. Among all these fragments, the caste system appears strongly in water distribution, because the caste system relies upon discrimination against those at the bottom of the social hierarchy (Sarkin and Koenig, 2010). There are numerous reports that the untouchable castes have been denied water or faced violence in trying to access water. While class has taken over from caste, these concepts remain somewhat important to Delhi’s current water supply distribution and access. Poor people are mostly associated under the lower class category and are more likely to face difficulty in accessing water. 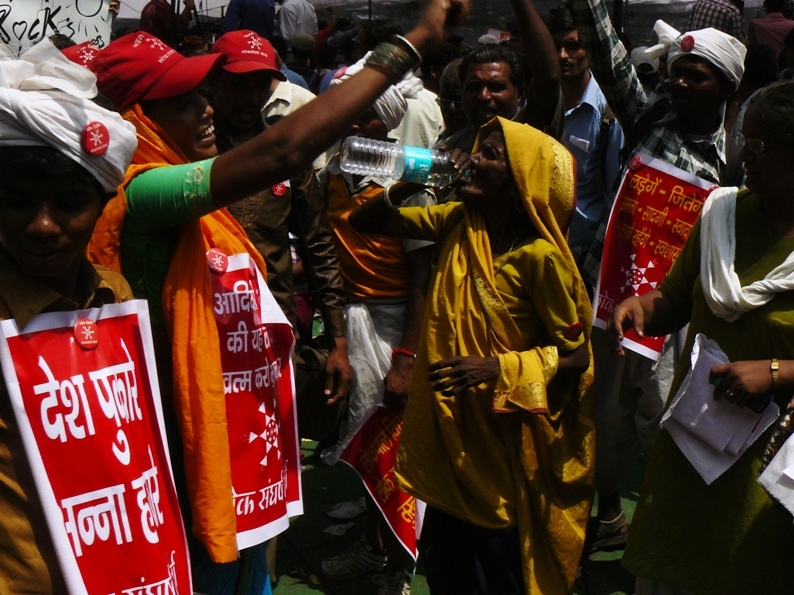 Just as social schism shapes access to water, politics also plays an important role. Water is a highly political issue in India, where politicians and councillors decide water distribution and pricing (Ramamohan, et al., 2014) and caste politics is a key issue here. Political leaders tend to give preferences to people of a similar background—whether caste, religion, language, or region. Issues of equity and access are key integrity concerns. The access issue—having a voice in decision making—is closely linked to the existence of transparency, accountability, and participation (TAP) mechanisms. Strengthening TAP can help in addressing equity challenges in Delhi’s water governance and management. In Delhi, securing water for all, especially for the most vulnerable, is not just a question of better infrastructure or greater investment, it is equally a matter of good governance. Decision-making processes as well as stakeholder involvement and capacity building can alter the situation. Government transparency has been on the agenda since India gained independence and has taken shape since the enactment of the Right to Information Act in 2005. Still, information is patchy and not easily available to the general public. Information on water demand, transmission losses, location of leakages, and where the lost water goes is not forthcoming. According to the Comptroller and Auditor General (CAG) of India, information is unavailable on the population size in each part of the city on how much water should be supplied to various parts of the city. CAG adds that distribution is generally based on assumptions; bulk water meters are absent across the distribution network and the amount of water entering the network cannot be tracked (Comptroller and Auditor General of India, 2013). This kind of environment—in which information is not recorded, and the legal framework of Delhi’s water system is unclear—makes the whole system vulnerable to corruption (Panickar, 2007). This affects equity, because without transparent information water can be distributed based on powerful influencers or bribes. The poor, marginalized, and minority residents cannot afford to lobby or pay a bribe. Accountability refers to the clear responsibilities of institutions and individuals, who must be answerable for their actions. It reflects a citizen’s right to question service providers over poor performance and to demand better service. Delhi’s current institutional framework does not allow for the separation of roles and duties of service delivery, sanctioning regulations, and financing, resulting in obscured accountability (Odugbemi 2008). Citizens do not directly question the water authorities. Instead, in jurisdictions across the country, the people elect a representative to mediate with the water authorities for their needs, demands, and concerns regarding the water authorities’ standards (Water and Sanitation Program, 2005). Where political intermediaries cater to certain audiences, many others (especially the marginalized) can be deprived of access to services. Participation implies that all stakeholders, including marginalized and resource-poor groups, are meaningfully involved in deciding how water is used, protected, managed, or allocated. In Delhi, Social Welfare Associations (SWAs) allow participating residents in planned neighbourhoods to meet and actively share their views on the water issues affecting them. These community groups play an important role in spreading information and awareness. However, SWAs, which are formally recognized by the authorities, cannot be established in illegal colonies. The result: people bracketed as lower caste or class and minority groups are excluded from decision-making processes and influence. Moreover, most citizens of low-income households are poorly educated, which undermines their comprehension of the bureaucratic processes of water management. This impends their ability to understand information and to participate. They stage protests, write to the press, or seek help from NGOs. This may solve some problems but does little to improve the system. The twin problems of inequality and lack of access to water provoke people to violate rules and use illegal ways to get water. In such an environment, people and groups with vested interests step in, leading to artificial scarcity of resources (Panickar, 2007). This combination of inequitable distribution of water, lack of adequate TAP processes, and corruption is a serious problem for consumers. In the slums and unauthorized colonies of Delhi, people spend hours waiting in queue at water stand posts. The limited duration and untimely supply of water also increases social tension among citizens, which results in frequent disputes in the streets, sometimes violent. On 26 September 2015, the India Express reported the first death to be caused by violence over water. It occurred at a public utility tap on a street called Peepal Wali Gali, which is barely five kilometres from Civil Lines, where Delhi’s lieutenant governor and several cabinet ministers live (Angad, 2015). Water tankers, both private and from the water utility, fill demand-supply gaps across Delhi. Many private tankers sell water without the permission of the water utility; households buy from these private suppliers. This is a highly profitable business. There is lack of adequate control over their access to water and these private tankers have no shortage of water sources, and can include groundwater too. (Bansal, 2012: 11). Recently it was reported that private tanker operators fill their tankers from the utilities booster pumping stations and that is not possible without the assistance of staff or officials (Bansal, 2012: 12). The government water subsidy scheme is intended for poor and marginalized residents. However, only residents, especially in the middle to high-income group with metered water consumption benefits from it, thus contributing to inequality. Women and girls bear most of the burden of water shortages, and suffer its negative effects on their health, education, and employment (Kher, et al., 2015). There are health implications as well: many unauthorized colonies and slums are in low-lying areas that lack proper sanitation facilities. The key reasons that people pay bribes include obtaining a water tanker from water utility, installation of a piped water supply, and repair of a water pipeline. Such additional payments for water not only affects a family’s financial stability but can be measured in terms of lost working days, human development, and lives. In Delhi in 2014, the average household paid around 20 US$ as a bribe, from a minimum payment of 5 US$ for a water tanker to a maximum payment of 75 US$ to bring down a water bill—significant amounts for low income families in India. (CMS Transparency, 2015). The lack of integrity in policies, project design, procurement, and construction has a major impact on the provision of quality services for all. In Delhi, several infrastructure projects are designed and huge investments are made without benefiting the public. In April 2015, for example, The Hindu reported that three engineers from the water utility had been arrested and charged with fraud for awarding construction contracts at a higher rate for so-called urgent projects. Later government enquiry revealed that, in fact, the work was neither necessary nor undertaken (Staff reporter, 2015). Equity is affected by policies too. In Delhi’s case, the ‘right to water’ is not recognized by the Constitution, rather it is derived through judicial interpretation (Cullet, 2013). Water is an everyday need and the day-to-day life of an individual is not organized by judicial decisions. It is comparatively easier for a resident to pay a bribe to get access to water rather than to go to court for the same. This is what people in Delhi do. Ensuring 20 kilolitres of water per month to every household in Delhi without any fee. Bringing piped water supply and sewage network to all in Delhi irrespective of their legal status. Upgrading the water infrastructure to reduce water losses. The government has placed emphasis on equal distribution of water to all, recognizing water as a human right. Under its government, the water utility is being revamped and several new projects are being launched. The water utility is connecting 237 unauthorized Delhi colonies to the water pipeline network; the work is expected to be completed by summer 2016 (Team MP, 2015). It also will expand the water supply in unauthorized colonies by installing 280 water kiosks, where water will be provided at 0.015 US$ per litre. The new government also intends to make the water utility more transparent and corruption-free. One of the efforts undertaken in this respect is fitting GPS systems to water tankers, so that location, schedule, and time-to-destination information can be made available online. This could help in lowering corruption by countering tanker mafia attempts to divert tankers from their routes (TNN, 2015). Lack of equity is a key problem for Delhi’s water supply sector. The new government seems to have a better perception of the root causes of the problem and has implemented a strategy for equity in water distribution. It is too early to draw conclusions about the sustainability of this approach. In order to minimize corruption risks and improve equity, diverse efforts—including participatory approaches and transparent availability of information—are needed. For a complete bibliography, download Inequalities in Water Service Delivery in Delhi (PDF). Editorial review by Tammi L. Coles and Binayak Das, WIN. PDF print design by Philip Kieckbusch, diehingucker.de. 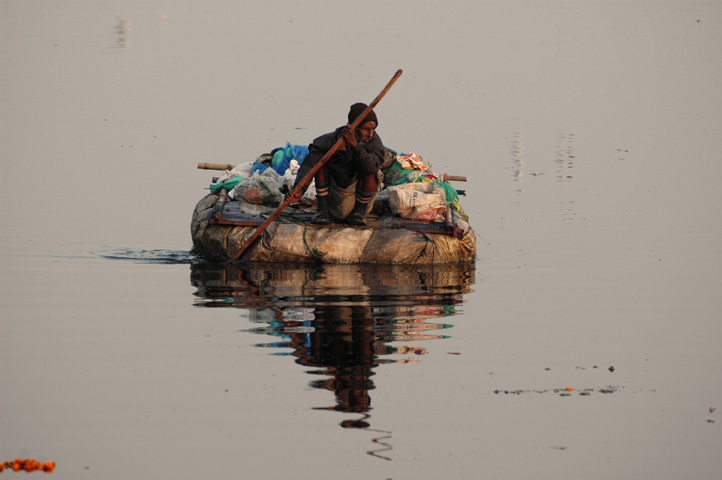 Creative commons image credits: “Floating rag picker” (2007) by Koshy Koshy via Flickr; “Water break !” (2011) by Dinesh Bareja via Flickr; “India 207” (2013) by Edmund Gall via Flickr.